Garbage everywhere and no garbage containers available to people to put their garbage in. The lack of garbage receptacles creates an unsightly mess all over the park. Please clean it up and install some regularly serviced trash cans throughout the park but specially at the entrances to the park. OAK 311 has received this issue. Your service request ID is #894791. Please check back for status updates, or contact us directly at 510-615-5566. The City of Oakland addressed this issue on 04/25/2019, service request #894791. Lexus (possibly GS 300) with expired license plate: 3LCY492. Color: grey has been abandoned for over 3 weeks following an accident. There is now a barbecue dumped behind it too and it has graffiti all over it. OAK 311 has received this issue. Your service request ID is #899111. Please check back for status updates, or contact us directly at 510-615-5566. Car is blocking Fire Hydrant. Broken window shield and no license plate. OAK 311 has received this issue. Your service request ID is #899114. Please check back for status updates, or contact us directly at 510-615-5566. 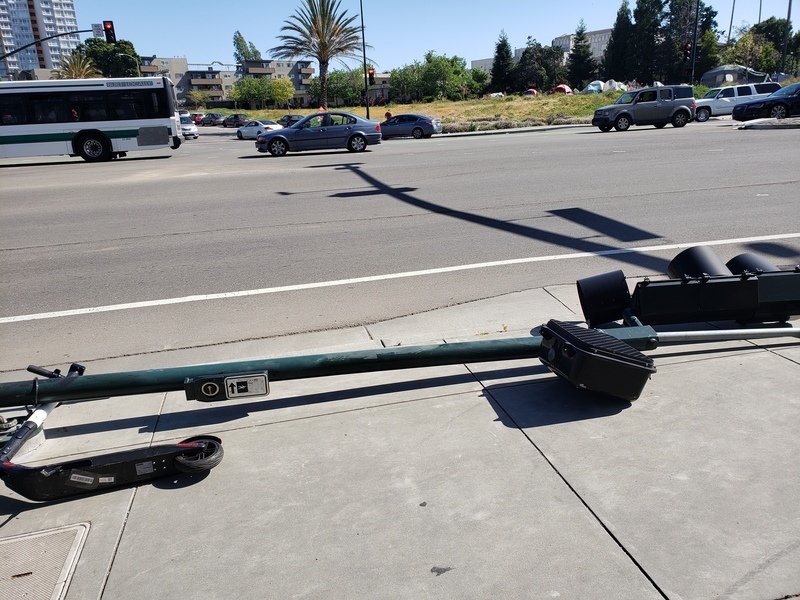 Traffic light at the intersection of Lake Merritt Blvd and Int'l and a scooter seemed have collided. They are on the sidewalk behind Lake Merritt UMC. please remove. OAK 311 has received this issue. Your service request ID is #899108. Please check back for status updates, or contact us directly at 510-615-5566. Please also contact the PWD call center 615-5566 or 311for all dangerous or hazardous issues. Traffic light and traffic sign damage or failures should always be considered emergencies. 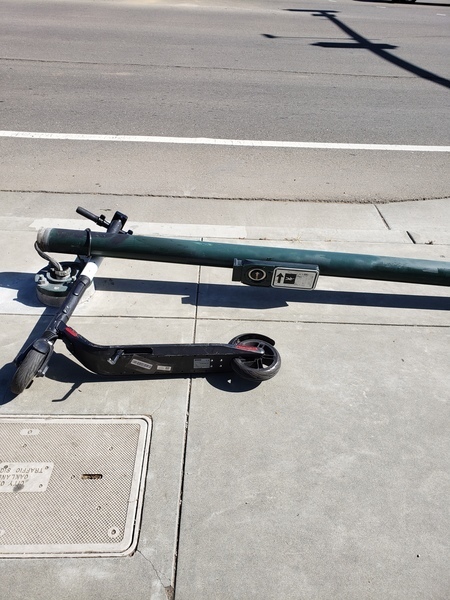 Looks like the scooter was the victim of one Oakland several thousand incompetent drivers. The dumping and homeless mess is getting out of control. (3) new cars up on blocks. OAK 311 has received this issue. Your service request ID is #887558. Please check back for status updates, or contact us directly at 510-615-5566. I don't understand why these vehicles are not towed by the city. This is getting to be stupid. Thank you for your request. According to our system, we already have an open service request of this kind at this location. Your request has been combined with service request #887486. If you would like to check the status of the request, please contact OAK 311 at 510-615-5566 or OAK311@oaklandnet.com. This issue can also be followed by watching http://seeclickfix.com/issues/5559144. No license plate parked in a bollard/restricted area. Connected to electrical and water. Slideout open, visibility restricted. OAK 311 has received this issue. Your service request ID is #895468. Please check back for status updates, or contact us directly at 510-615-5566.
bags of garbage, loose garbage dumped last night. Garbage is blocking wheelchair access to the sidewalk. OAK 311 has received this issue. Your service request ID is #897339. Please check back for status updates, or contact us directly at 510-615-5566. The City of Oakland addressed this issue on 04/25/2019, service request #897339. Your post path is not a solution-it is a pass for bad behavior. This situation is a problem, and it is getting worse. Though your narrative may be accurate (or not)-there is simply no reasonable basis for these encampments to be completely blocking public sidewalks and flooding the area with trash and human waste. The homeless population may have few options-but: the least this population could do is WORK TO KEEP THEIR ENCAMPMENT CLEAN AND ORDERLY. That should be the minimum price of squatter admission. If it is not "paid", the city needs to clear the hazard out. Do this and the people involved will learn to "pay up", to prevent being cleared out. As it is, as these things grow, theft in the local area ramps up. Our development is now inundated DAILY with trespassers and parcel thieves. Add the theft to the trash dump nature of these encampments and you have a perfect recipe for massive public resentment. These people should be trying to fly under the radar-not flaunting their squatting in a manner that @#$% everyone off. OAK 311 has received this issue. Your service request ID is #886087. Please check back for status updates, or contact us directly at 510-615-5566. The City of Oakland addressed this issue on 04/25/2019, service request #886087. OAK 311 has received this issue. Your service request ID is #886084. Please check back for status updates, or contact us directly at 510-615-5566. The City of Oakland addressed this issue on 04/25/2019, service request #886084.